At the 2018 Iowa State Cross Country Championships, the Southeast Polk Rams edged out the reigning Champions from Johnston by just one point. Though the Dragons ran well and had 3 of their top 5 returners place the same or higher than the year before, the Rams had multiple huge PR's and improvements within their top 5 to claim the title. The Rams were led by rookie Mattison Plummer who finished in 2nd place with a time of 18:28, an incredible PR of over a full minute for the sophomore. Plummer, who had been recruited to run cross country by a fellow track athlete impressed this season by improving each week and bringing home a win on her home course at the Conference meet just a few weeks before. For the Johnston team, junior Brooke McKee led the Dragons with a third place finish in 18:43- one place and one second faster than she ran at the State meet in 2017. For the second runners, SEP had sophomore Grace Larkins who finished in 18:50- a 31 second PR for 4th place overall. Larkins finished in 61st place at the 2017 State Championships and only had 2 races all season with finishes higher than 4th place prior to to the State meet this year. Johnston was represented by freshman Aleah Tenpas who ran 19:06, just 4-seconds off of her PR and an 11th place finish at her first State Championship meet. Tenpas was the highest finishing freshman this year. At the third runners, SEP had yet another sophomore, Magda McGowin who ran 19:28 for an 18th place finish and a 24-second season best, 23 places higher than in 2017. 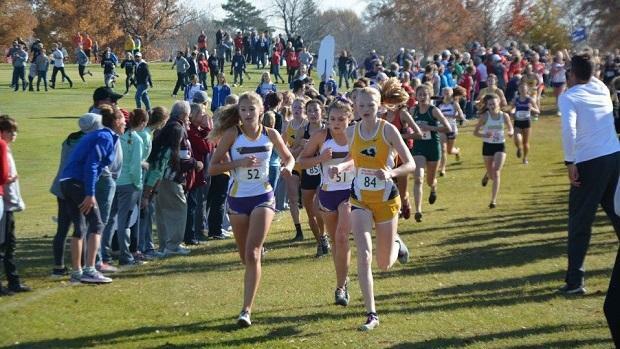 Johnston had returning individual State Champion Paige Horner as their third runner in 14th place in 19:14, a 15-second season best for the junior who had only run 2 meets prior to the State meet and sat out at the District meet due to injury. The fourth runners were as tight as can be, finishing just a tenth of a second apart with a video review by race officials. Though Johnston's Clara Toot had been running SEP's Paige Blackford down in the last 400 meters, Blackford out-leaned her at the line to take 25th place with Toot in 26th at 19:43.90, respectively. Toot ran 23 seconds faster than she did at the 2017 State Championships and finished 45 places higher. Blackford, SEP's only senior this year ran a big overall PR of 32 seconds and finished 93 places better than last year. Both athletes had exceptional days, but Blackford was able to hold Toot off to aid in the Rams' team score. For the final scorers, SEP had junior Natalie Clement who finished in 42nd place at 19:58, a season best by 53 seconds and an overall PR of 25 seconds. Clement finished in 95th place at the 2017 State meet. Johnston's 5th runner was Bella Heikes just ahead of Clement in 19:56 for 40th place, the same place she nabbed at the 2017 State meet. Overall, it is clear that Southeast Polk had a steady incline throughout the season and peaked at just the right time. With multiple 30+ second PR's across their team and huge improvements on places from last year, the Rams were able to bring home the win over the strong Johnston team. With 6 of their top 7 returning next year, they will most definitely be a favorite for a podium spot again!